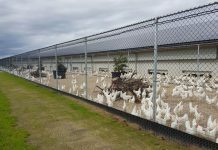 Consumer-driven expansion of free-range poultry products has led to significant increases in the number of free-range poultry farms and the total percentage of the national flock dedicated to free-range production. 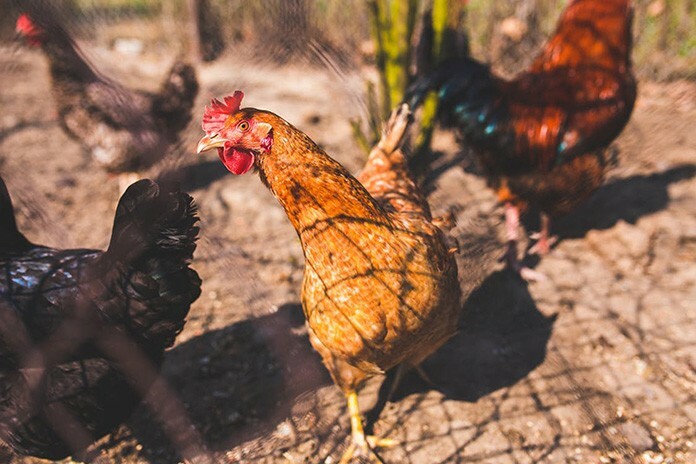 Free-range management increases the risk of contact between commercial poultry and wild birds, thus potentially increasing the likelihood of Avian influenza (AI) outbreaks. On-farm surveys were conducted to better understand the risks posed by free-range management on commercial chicken farms in relation to AI outbreaks compared to other management systems. The data collected will be used to inform mathematical models which will quantify risk reduction that may be achieved by actions implemented on-farm to mitigate AI virus entry. AI has caused enormous losses in poultry production worldwide, including Australia. In most cases of highly pathogenic avian influenza (HPAI) virus infection, gallinaceous poultry are found dead prior to the observation of any clinical signs. Morbidity and mortality rates are very high (50-89%) and can reach 100% in some flocks. 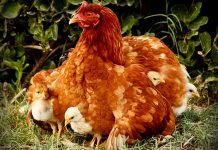 Australia has experienced seven HPAI outbreaks in poultry farms in Victoria (three separate outbreaks), Queensland (one outbreak), and New South Wales (three separate outbreaks) since 1976. The latest outbreak affected two farms in Young, NSW in 2013. Most of these outbreaks were limited to one farm and all involved chickens, either layer (four farms), broilers (two farms) or broiler breeders (four farms). Three outbreaks affected farms of other poultry species, specifically ducks and emus. In all farms there was opportunity for direct or indirect contact with waterfowl. All viruses were of subtype H7 and of Australian lineages. Most outbreaks occurred during spring and summer (October to January), with the exception of the Bendigo, Victoria outbreaks in 1985 and 1992 which occurred in late autumn and winter (May and July) respectively. Four of the last seven outbreaks have occurred in the last 10 years, suggesting outbreaks are occurring more frequently. Australia has experienced a significant expansion of free-range poultry production due to consumer demand in recent years. In 2006 the Australian Chicken Meat Federation (ACMF) regarded free range chicken meat production as a cottage industry. 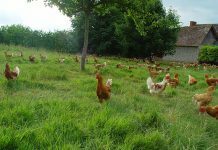 However in only five years free range chicken meat production grew significantly to about 15% of the total market in 2011. 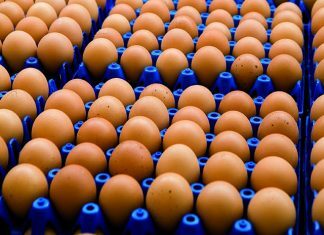 Similarly, the retail market share of free range eggs has increased from 10% in 2000 to 40% in 2013. Theoretically the expansion of free range production systems increases the likelihood of AI virus introduction into poultry flocks due to greater opportunities for contact between wild and domestic birds. However the change in probability of outbreak occurrence with increased proportion of free range farms has not been quantified. On farm actions to reduce AI virus introduction and spread have also not been quantified. There is a need to better understand AI outbreak risk to inform the industry on preventative actions that can effectively reduce risk. A research project commenced in 2015 to address these knowledge gaps. The research team is developing mathematical models to quantify the probabilities of AI introduction and spread in both layer and broiler production systems of all types (cage, barn, free range), and to quantify risk reduction that can be achieved by various on-farm preventive actions. These models require inputs relating but not limited to farm management practices, virus behaviour and wild bird ecology. Data on these inputs is being obtained from the literature, expert opinion elicitation and conduct of on-farm surveys. This paper describes the on-farm surveys conducted during 2015 with the objective to document current farm layout and management practices relevant to AI introduction to a farm and then spread farm-to-farm on layer and broiler farms of all types in the Sydney basin region. A comprehensive farm list sourced from various corporations, integrators and private consultants was created which listed most, if not all, chicken farms in the Sydney basin region, which extends from Seaham to Bateman’s Bay. This region was selected because it has had an AI outbreak in the past and it contained all farm types of interest. As AI risk is considered greater in layer chickens rather than broilers, a greater number of layer farms were surveyed compared to broiler farms (60% vs 40%). Farms were randomly selected from the comprehensive list. Farmers were contacted by telephone, the project explained to them and they were invited to participate in the project. Sixty-four chicken farms were visited; nine cage layer, nine barn layer, 25 free range layer, 15 non-free range broiler and six free range broiler farms. Sixty-nine per cent of farms use town water as the source of drinking water for the chickens. The next most common source was bore water (19%), followed by a natural nearby water body (8%) and then the farm dam (4%). Ninety-four per cent use treated water and this includes farms using town water which is assumed to be treated. Eighty-one per cent of farms that treat their own water use chlorination. Water used for environmental control methods such as foggers, cooling pads and irrigation of the range area is usually from the same source as the drinking water, however 13% use a different source, and of these 91% do not treat this source. The mean distance to the next poultry farm is 3.5 kilometers. The mean minimum distance from a waterbody to shed is 191 meters. Eighty-eight per cent of farms have seen waterfowl on water bodies near the sheds, where farms have an average of 1.5 dams on the property. An average of 0.88, 1.11, 1.36 dams are present on cage, barn and free range layer farms respectively and an average of 1.4 and 2 dams are present on non-free range and free range broiler farms respectively. Fifty-four per cent of farms reported seeing wild birds inside chicken sheds of which all report to be small birds such as sparrows and finches. The breakdown per farm type was 56% cage and barn layer farms, 52% free range layer farms, 47% non-free range broiler farms and 83% free range broiler farms. Overall, 54% of farms stated that the wild birds inside sheds occurred commonly. Seventy-nine per cent of farms have seen wild birds on top of or around feed storage areas, which in most cases are silos. More than half (58%) report wild birds present during feed spills, where farmers that do not report wild birds during this instance explain that it is due to prompt cleaning of the feed spill. Most farms (63%) have dogs and/or cats on the property and 44% of farms have ruminants. No farms sell live birds at markets but 6% of layer farms sell chickens on the property as backyard hens. One company delivers the majority (97%) of pullets. One company takes the majority (84%) of spent hens from layer farms. For broilers, the delivery of day old chicks and the removal of chickens for processing are performed by the same delivery companies within that broiler company. Farmers were asked where they get information from regarding poultry health and industry news, what methods of information delivery were used and to rate these sources and delivery methods in terms of reliability. Eighty-three per cent of farmers use a veterinarian as an information source and all rated veterinarians with the highest level of reliability. Newsletters were the most common form of information delivery (60%) and were rated on average as ‘moderately’ reliable. Farmers were asked to indicate the biosecurity practices they followed on farms and rate them on a scale of importance. Ninety-per cent of farms had a biosecurity manual and this practice gained an average rating of ‘extremely important’; the highest rating level. The average rating for visitor recording systems was ‘very important’. It was found that 74% of farms overall had a visitor recording system in place with the prevalence being the highest in free range broiler farms (100%), followed by non-free range broiler (93%), free range layer (80%), barn layer (56%), and cage layer (25%). More than half of farms disinfect vehicles (64%) and equipment (71%) between farms. There is little disinfection of vehicles (28%) and equipment (29%) between sheds and these were both rated ‘moderately important’. Ninety-two per cent of farms do not allow animals inside sheds and rated this as extremely important. Most farms remove manure (88%) and provide fresh littler/shed sanitization (96%) between batches and these were rated as ‘extremely important’. Seventy-eight per cent of farms have workers that do not come into contact with other birds or poultry farms and this was rated as ‘extremely important’. Waterfowl commonly visit water bodies on poultry farms that are in close proximity to chicken sheds which is a concern in terms of avian influenza introduction. Most farms follow basic biosecurity practices but actions can be put into place to increase the proportion of farms doing so. This can be through the implementation of biosecurity audits and/or through a series of workshops to educate farmers.